The thermomechanical behavior of shape memory alloys is due to a martensitic-austenic phase transition and - at low temperature - to martensitic twinning. 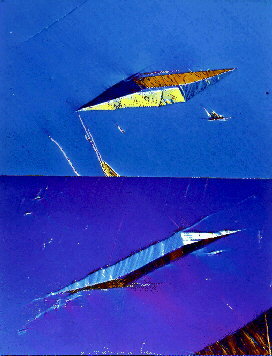 In single crystals the transition and the twins can be observed with the naked eye. Just click on any of the small pictures to display a larger version. Martensitic plate groups in CuAl14Ni4.2 (wt%) single crystal in austenitic matrix. 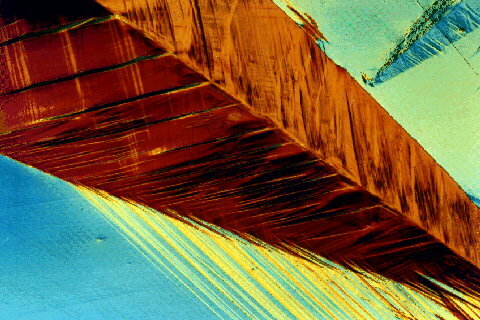 Growth and decay of a martensitic arrow in an austenitic matrix upon cooling and subsequent heating.CuAl14Ni4.2 (wt%) single crystal. 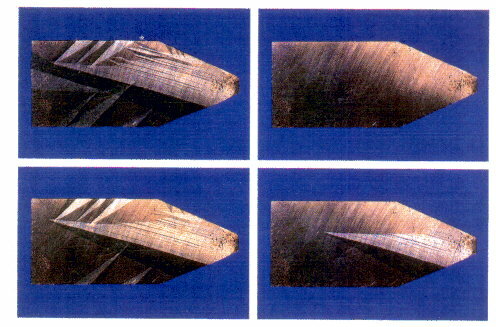 Martensitic arrow in austenitic matrix. CuAl14Ni4.2 (wt%) single crystal.